This hike was planned on a whim. Somewhere in the midst of our conversation we got talking about biking and getting outside for some fun. Matt H. quickly did some Google-ing and found that Rebel Sports in Frisco had good bike rentals. He and I were quickly walking down the road to rent some bikes for the day. About 10am we got down there and for $15 for 2 hours plus another $2/hour past that we were off. 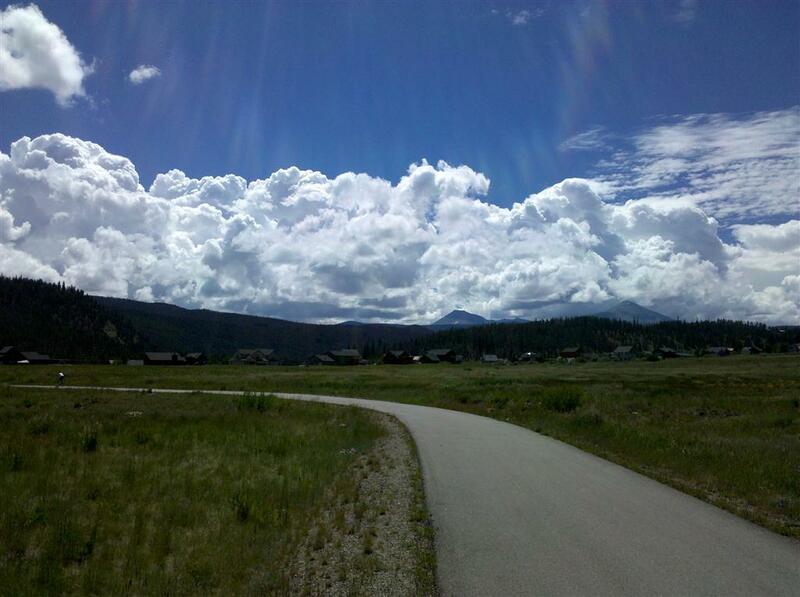 We hopped the trail in Frisco and headed for Breckenridge. 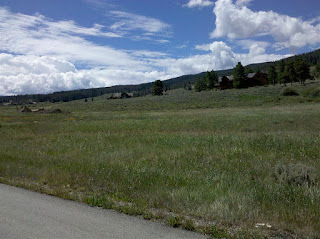 There was a brief climb and then a downhill in the forest heading south out of Frisco. 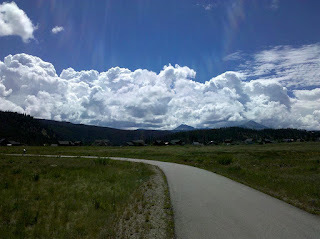 The rest was a gradual climb down to Breckenridge. This took us nearly an hour to reach Breckenridge where we stopped near downtown and the first gondola ride. We turned around after a snack and enjoyed the now gradual down-slope back to Frisco. We cruised on this part and stopped just once for a picture. The up-climb back into the forest near Frisco was a challenge. We made it back by noon for lunch at the condo. We inquired at Rebel Sports about their "free" shuttle up to Vail Pass but that was only valid for people paying the daily rate. We decided to hitch a ride in one of the minivans for Vail Pass in the afternoon. The Vail Pass idea was enough to get Denny (Dad) on a bike. He quickly went down to the shop and rented a bike of his own. We found Sarah to be kind enough to drive us and so we loaded three bikes into a minivan and were off to Vail Pass. With me as driver I messed up and missed the exit for Vail Pass which meant driving another 7 miles on to Vail itself, u-turn, and then back to Vail Pass. 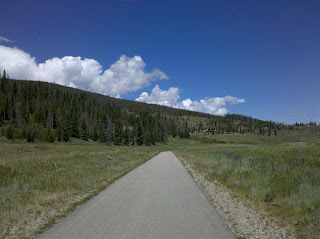 Matt, Dad, and I began the great descent from Vail Pass. This was a blast as we were able to cruise almost the entire way down to Copper Mountain, riding the brakes through several portions. We only had to actually pedal 2 or 3 short times to get to Copper. In Copper we had to slow down considerably as the bike trails wound through the small town. The rains started on us as we hit the east side of Copper. We stopped under a gas station canopy to stow our electronics in our backpacks and then hit the trail again. The rain was just light enough it didn't kill our traction on the bikes, but we did have mostly sprinkles the rest of the way to Frisco. We arrived back at the condo around 3pm and we returned the bikes. I have here a KML file which combines the tracks from all 3 legs of our biking.